The entire city was a river—impossible to find a shore. We’re thrilled to present the first installment in a five-week spotlight on Indian languages, to compliment the Indian Poetry Special Feature in the new Winter Issue of Asymptote. For the next few Thursdays, you can discover a spectrum of new voices translated from different regional languages, which, in many cases, have never been featured on the blog or in English before. 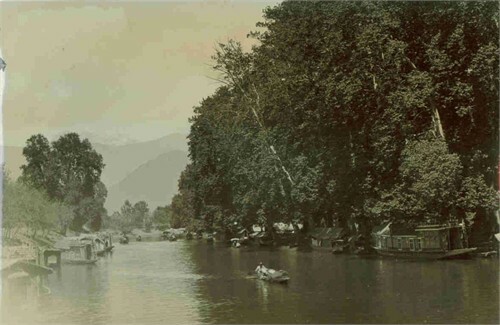 To kick things off, we have Niyati Bhat’s translation of Naseem Shafaie’s Kashmiri poem, “Tale of a City,” for you today. are drowning in their shame today. and wore silk brocades from head to toe everyday. The skies, too, loosened the reins, a little. at the sight of this spectacle. to wipe out the entire city. No one at the doorway to quench their thirst. impossible to find a shore. Nor any murmurs to console each other. used to be rich until yesterday. lived in palaces until yesterday. I began translating from Kashmiri to English with Naseem Shafaie’s poetry. Although, as a translator, I am still an infant, her poetry allowed me to conjure up a disciplined approach to the task. Some difficulties in transferring the overall tone of the poem did arise and so did the occasional doubts about the project. The process of acquiring the original tone of the poet can be slow, but I hope it finally came through. Kashmiri language in itself presented a challenge at times, for Kashmiri words have a tonal quality attached to them, which is difficult to represent when a word is translated and replaced. This led to a conflicted relationship with the thesaurus, but I assume that it is all a part of the process. Shafaie’s poetry is inspiring and made the task feel easier than it was. She works largely with metaphors, which are tricky because you want to avoid interpretations and you cannot let them slip into the original voice. So I treaded carefully and maintained the metaphors as they were. Focusing on literal translation felt like the right way of going about it. Overall, it has been an enthralling experience. Naseem Shafaie is a Kashmiri language poet. She was born in Srinagar, Kashmir on December 25, 1952. Her first collection of poems, Darie-Che-Mutchrith, was published in 1999, and has since been translated into different regional languages as well as English, German, Italian, and Korean. In 2011, Shafaie became the first Kashmiri woman to win the Sahitya Akademi Award for Kashmiri Literature for her second collection, Na Thsay Na Aks (2009). The collection was also among the eight winners of the inaugural Tagore Literature Award in 2009. Now retired, Shafaie used to teach as an Assistant Professor of Kashmiri for Higher Education, Government of Jammu and Kashmir. Niyati Bhat is a Kashmiri writer and translator. Currently, she is pursuing research in Cinema Studies at Jawaharlal Nehru University. She also writes about literature and migration. Her work has appeared or is forthcoming in various publications, including Scroll, Coldnoon, Mithila Review, Hindustan Times, and Al Jazeera. She works and resides in New Delhi. Sign up to be a sustaining member today at just $5 a month! We’re still short of hitting our target by several members; each additional membership takes us closer to being able to operate beyond April 2017. To reward your support, we have a whole range of Asymptote memorabilia—don’t forget to check them out!